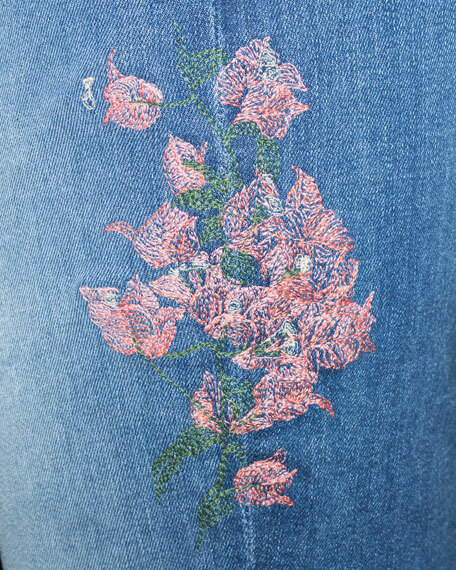 Jen7 by 7 For All Mankind jeans in floral-embroidered stretch-denim. For in-store inquiries, use sku #2472815. 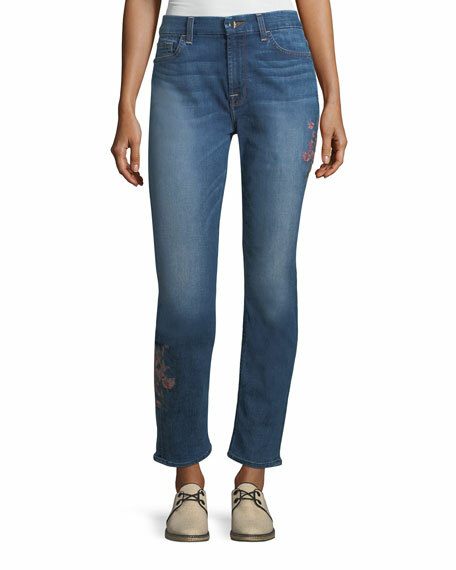 Alexander McQueen skinny jeans, featuring corded tux side. Mid-rise. Five-pocket style. Skinny-leg fit. Cropped above ankles. Button/zip fly; belt loops. Alexander McQueen skinny jeans, featuring corded tux side. Mid-rise. Five-pocket style. Skinny-leg fit. Cropped above ankles. Button/zip fly; belt loops. Viscose/polyester/silk. Dry clean. Made in Italy. ALICE + OLIVIA JEANS "Good" jeans in gray-wash denim. Approx. measurements: 11" rise; 27" inseam; 10" leg opening. High rise; skinny-leg fit. Five-pocket style. Cropped above ankles. Exposed zip fly; belt loops. Cotton/EME/spandex. Made in USA of imported material. Derek Lam 10 Crosby "Devi" jeans in light-wash denim. Distressing, whiskering, and fading. Mid-rise; belt loops. Button-zip fly. Five-pocket style. Derek Lam 10 Crosby "Devi" jeans in light-wash denim. Distressing, whiskering, and fading. Mid-rise; belt loops. Button-zip fly. Five-pocket style. Fitted through skinny-legs. Ankle-length. Cotton/spandex. Made in USA of Italian materials. Model's measurements: Height 5'10"/177cm, bust 33"/84cm, waist 25.6"/65.2cm, hips 35.8"/91cm, dress size US 2-4/FR 34-36.